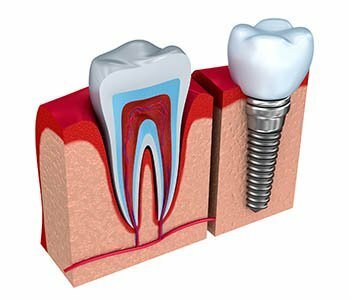 A dental implant is actually a replacement tooth root on which an artificial tooth is installed. It is simply a metallic post made from titanium alloy which is screwed into the jaw bone. 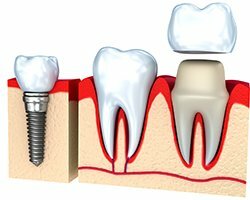 A dental implant is actually a replacement tooth root on which an artificial tooth is installed. It is simply a metallic post made from titanium alloy which is screwed into the jaw bone. Titanium metal is especially suitable for this purpose because of its unique ability to induce bone formation around the implant, thereby increasing the retention and stability of any prosthesis that is placed over it. Osseo-integration literally means ‘bone integration’. A natural tooth is held to its socket in the jaw bone by natural connective tissue. No such connective tissue is available to hold a metallic post that is screwed into the jaw bone. Titanium and its alloys have this unique property to induce formation of bone cells in the surrounding of an implant, so that a very strong natural continuityis developed between the metallic implant and the bone. This process is called ossoeintegration and is very essential for the long term success and durability of dental implants. The first thing you need to know about dental implants is that they have a high up-front cost. It can take two to three months in the standard procedure (although ‘same day’ implants are also becoming popular). Another fact you want to know is that implants also requireroutine, rather enhanced oral hygiene care than your natural teeth. Can Everybody Get an Implant? Yes, anybody who needs one or more replacement teeth can consider dental implants. However, there are exceptions. The implant has to bear chewing forces like a healthy normal tooth. you must have sufficient mass and quality of bone at the proposed site of the implant to hold the tooth under these forces. Also, you must not have any underlying chronic medical or dental problem if you need to get dental implant. Your implant specialist will make a thorough examination, and determine if an implant can benefit you. Why Are Implants So Popular Despite Their Cost? Just like natural– Teeth on implant are just like natural teeth. They can be used to chew almost any food you like as you would do with your natural teeth. They look also like natural teeth because they are not supported on any superficial structure. Rather they are rooted in the bone. Long life- Implants are virtually for a life time. Other restorations need repeated replacements. No bone loss– Implants do not trigger any bone loss. Rather, they allow bone to grow into their metal. Facial contour preserved– Excessive bone loss in the jaw due to conventional dentures can lead to shrinking of facial contours. With implants there is no such problem. Always in your mouth-Implant supported dentures need not be removed at night. Those are permanently installed and you sleep with them on. No storage hassle– Unlike conventional dentures, implant supported dentures need no special storage because they remain in place. No embarrassing moments-Implant dentures are fixed, and do not cause any embarrassment to the wearer by slipping out. By now, you must have decided to get dental implants for replacing your missing teeth. If that’s the case, then you should consider visiting us at Barnaby Square Dental so that you can enjoy a beautiful new smile and perfect teeth.